Wilbur Post is a young architect who moves to a country home with his wife, only to discover that it comes with a horse that talks...but only to him! 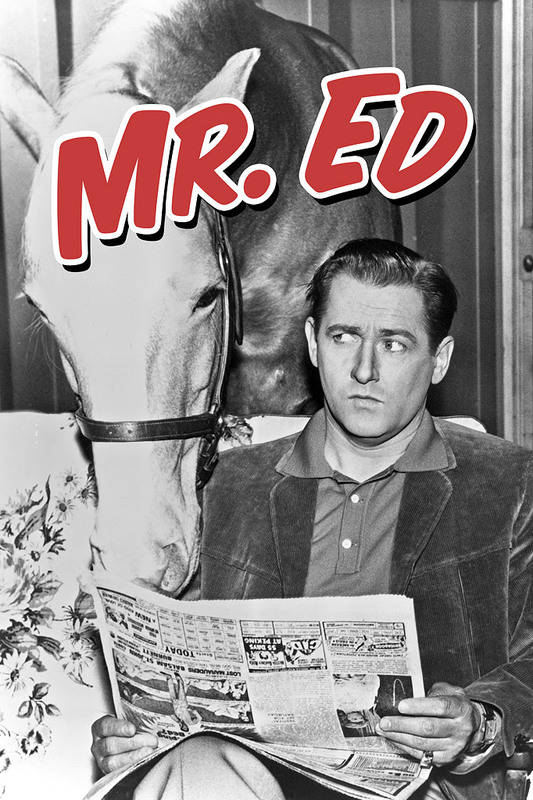 Mister Ed gets Wilbur into lots of trouble, but occasionally comes to the rescue as well. Ed, The Shish-Kebob: Wilbur is invited to attend a convention held by a bunch of magicians (The Great Blackstones), and decides to take Carol and Ed along also. Ed in the Peace Corps: Ed is frustrated when Wilbur hires a secretary who happens to be a Japanese exchange student. The reason Ed is so angry is because she is always there and Ed can't speak to Wilbur which causes him to get frustrated. Ed, The Desert Rat: After a fight with Wilbur, Ed heads for all open land which in turn takes him to the desert which he falls victim to all types of misadventures. Ed, The Donkey: Ed is offended when he is constantly called a jackass all the time, so Ed insists that Wilbur take him to the vet to make sure that Ed is still a horse. Ed Visits a Gypsy: Ed wants Wilbur to take him to a Gypsy to get his hoof read. That way, he will get with a spirited filly whom he is in love with. Old Swayback: Ed becomes friends with an old swayback horse, whom everyone ridicules, and convinces Wilbur to let the horse stay with them. Mae West Meets Mr. Ed: Ed overhears Mae West commissioning Wilbur on creating ultra deluxe stables for her horses. When Ed overhears the conversation, he starts to get discontented with his own surroundings. Ed, The Chaffeur: Ed tells Wilbur that there is nothing to driving a car. Wilbur scoffs at the idea and Ed must show up Wilbur. Ed, The Musician: Everyone gets involved in a local variety show, which makes Ed feel left out. Ed then concocts a plan which he can be a one-horse band and starts to practice in the barn after midnight. Prowler, The: While a prowler is loose in the neighborhood, Wilbur plays detective while Ed is holding the prowler. Saddles and Gowns: Wilbur refuses to buy Ed a new saddle and Carol a new dress. Moko: Kirkwood plans a party for his straight-laced, former Commanding General. Problems hit when a little Martian changes the whole thing around. Hi-Fi Horse: Wilbur buys a stereo for his and Carol's anniversary, but Carol complains that it isn't a very personal gift. Ed, The Pool Player: Kirkwood goes over the line in playing with pool sharks so Ed comes to his rescue. Ed Writes Dear Abby: Ed writes to Dear Abby on account of getting a bachelor stall. Ed’s Tunnel to Freedom: To teach Ed a lesson, Wilbur locks him in his stall so he can't steal any more brownies and warm baking pies out from the kitchen window. Heavy Rider, The: After a recommendation for Wilbur's architectural abilities, Wilbur's next job is to design a shopping mall. When the really heavy investor wants to ride Ed around, Wilbur doesn't see a problem. But Ed does. Ed, The Pilot: Ed desires to learn how to fly an airplane. Animal Jury: Wilbur's visiting aunt stops by with her pet parrot. The bird ends up at the pet store and Ed must convince Wilbur that a cat drove the parrot there.